Lau Kin Chi is an associate professor in the Department of Cultural Studies at Lingnan University. The author would like to thank Jin Peiyun for research assistance. According to the Inclusive Wealth Report 2014, between 1990 and 2010, China’s Gross Domestic Product (GDP) grew by 523 percent, but only 47 percent in terms of “inclusive wealth,” taking environmental factors into consideration. The Inclusive Wealth Index’s adjusted average growth rate for China was negative during this period. 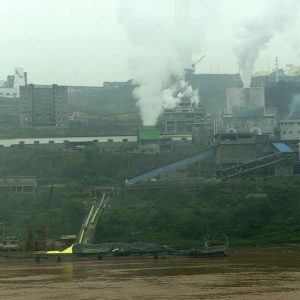 China’s Ministry of Environmental Protection estimates that redressing and preventing water contamination alone will cost $320 billion and take at least forty years, and experts estimate that treating the three most severe sites of contamination—water, air, and soil—will cost $960 billion. These most severe contaminations foreground not only the question of remedial expenses, but also the ways different social sectors are affected both by the contaminations and by the government’s responsive efforts. Below, I adopt subaltern and ecological perspectives to challenge statist, elitist, and anthropocentric discourses and practices related to the question of sustainability in China. In late 2017, two news stories from Beijing drew popular attention and anxiety: the expulsion of over three million people from so-called low-end populations within a few days of the Daxing fire in southern Beijing, and the coercive conversion of fuel from coal to gas in northern China, leaving massive numbers of people in towns and villages without heat in the freezing cold.1 The former was a move to expel migrant workers as well as small and medium industries from Beijing; the latter was part of an effort to improve air quality, with immediate negative consequences for the poor. On their surface, both actions could be justified. In the first case, the Daxing fire, which killed nineteen people, made clear the fire hazards of slum communities in peripheral Beijing, where migrant workers on the margins of society find cramped but inexpensive lodging. After the fire, in the name of safety, residents were speedily evicted and their homes demolished. Such slums were also sites of enormous accumulations of urban waste. Among the reported millions of migrant workers forced to move further out to the edges of the city or to return to their home villages, many were scavengers. It is estimated that there are 3.5 million scavengers in China, with 150 thousand to three hundred thousand working in about four hundred garbage sites around Beijing, which produces around twenty-three thousand tons of garbage per day, with about 30 percent collected for recycling.2 In 2008, there was only one waste incinerator in Beijing; by 2018, there were eleven, able to incinerate 5.97 million tons of garbage each year. According to a 2017 report, the dioxins produced by these incinerators caused 3,779 persons in Beijing to contract cancer every year, with a social cost of over 37.3 billion yuans—around 1.33 percent of Beijing’s GDP.3 It is not known what percentage of scavengers left Beijing after the eviction or if they would return; the city has a stated aim of keeping its population under twenty-three million; hence eviction is not an interim measure, but part of a long-term policy. By early December 2017, when the government softened its formerly uncompromising ban on all coal burning, conceding the need to prioritize heating for the population, most coal burners had already been destroyed.9 The good news, at least for those able to heat their homes, was that air quality in northern China seemed to have improved. If the compulsory conversion from coal to gas revealed official biases against rural populations and the urban poor, the question of water diversion shows the biases in favor of metropolitan centers at the expense of provincial regions. The South-to-North Water Diversion Project is a marked example. Like the Three Gorges Dam project, it is a mega project with potentially catastrophic ramifications for public health and the environment, but launched with a deep faith in the benefits of science and technology. The modernization paradigm that China has pursued in recent decades has tended to privilege industry over agriculture, urban areas over rural ones, and the middle class over the subaltern, with the country’s growth statistics and policy emphases accordingly geared to such a paradigm. “Modernization” itself is not questioned and justifies the “price” that must be paid. Underpinning the modernization fantasy is science and technology, perceived as inherently progressive. The result—the almost mindless degradation of nature—derives from the arrogance and vanity of the anthropocentric urge to control. The Three Gorges Dam was built to be the largest in the world: 185 meters high and 2.15 kilometers long, with a water level reaching 175 meters and the dam reservoir extending 600 kilometers in length and on average 1.12 kilometers in width and containing 39.3 cubic kilometers of water over a total surface area of 1,045 square kilometers.12 There was speculation that the devastating Sichuan Earthquake of 2008 might be attributable to the dam, though such an effect is difficult to prove or disprove scientifically. The Three Gorges Dam was intended to generate hydroelectric power, whereas the South-to-North Water Diversion Project was inspired by concerns about water resources. China’s per capita access to fresh water is only 25 percent of the world average. Over the last two decades, climate change and weather extremities, including droughts in the North and floods in the South, have exacerbated the already uneven distribution of water. Furthermore, after the early 1980s, the decentralization of industries and mining from the national government to township and village enterprises (TVEs) was for a while seen as an impetus toward expanding China’s manufacturing sector and extending opportunities for rural “development.” Per capita income in many rural regions has indeed increased since the mid–1980s. However, rural industries exploit not just local labor, but also water resources, which in turn also contaminate the soil. After industrial pollution, the leading sources of contamination are untreated urban sewage disposal and excessive use of pesticides and chemical fertilizers. This was the background to the argument for the South-to-North Water Diversion Project. With construction beginning in 2002, the water diverted for all three Eastern, Central, and Western routes was projected to total 44.8 billion cubic meters by 2050, when the entire project would be completed. The Central route alone is 1,264 kilometers long and takes one-third of water from the Han River to the North; Beijing and Tianjin will each receive over one billion cubic meters per year, while Hebei and Henan provinces will each get three billion cubic meters. The first phase of the Eastern route began diverting water in November 2013, and the first stage of the Central route started in October 2014. The challenge along the Eastern route, which covers 1,476 kilometers, is to channel Yangtze water upward by sixty-five meters, through thirteen pumping stations, to Dongping Lake in Shandong province, before sending it flowing down to the North, crossing the Yellow River through an underground channel. From there, one route would go north to Beijing, Tianjin, and Hebei, while another would travel east to Shandong Province. One positive consequence of the project was remedial work to clean up the water. The water in Nansi Lake, the main collection nexus of the Eastern route, was rated worse than Grade V when the project started. 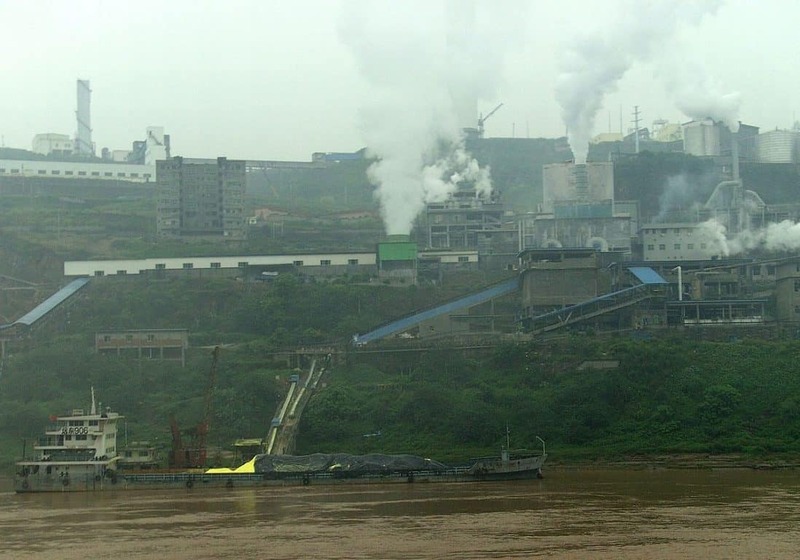 To improve the water quality to Grade III, a major program was introduced to remove heavily polluting industries, such as the seven hundred paper factories in Shandong Province, which together accounted for 70 percent of the province’s pollution.16 Water diversion would not be possible until water quality could be improved to Grade III. The projected scale of diversion could amount to an annual thirteen billion cubic meters of Yangtze water. In the first three years, a total of 18.766 billion cubic meters of water had been pumped from the Yangtze River for the Eastern route. Of this, a total of 1.1 billion cubic meters was channeled to Shandong Province. This is a classic example of major cities making unsustainable use of water and energy resources. Instead of reducing metropolitan populations, promoting deurbanization, or finding local alternatives to disruptive mega-projects, the supreme human will to dominate nature is asserted, and resources are mobilized to suit the needs of the nation’s power centers. Beyond its huge cost, the project is founded on a kind of contempt for nature that is sure to invite nature’s revenge. The south-to-north diversion crosses over seven thousand rivers, tributaries, and streams that flow largely from west to east. It is not difficult to imagine the huge disruptions and engineering challenges involved in channelling the water to run above, below, or across west-east flowing rivers. In some regions water will flow in a tunnel under the Yellow River, while in others elevated pipes will hang in the air, and if they were to break, these areas would face catastrophic floods. Some scientists also warn that the mixing of river waters entailed by such diversions can cause disastrous contaminations. If the only priority is to supply Beijing and other cosmopolitan cities, one could ignore the huge disruptions in the habitats sustaining the livelihood of rural and provincial populations, given how sustainability is conceived by the elites. As long as Beijing continues to get enough water, these projects are considered “sustainable,” however irrational the project may be in its costs, technological flaws, or burden on other sectors. The “sustainability” of Beijing is vital to the vision of the state leadership and urban middle class, the upper echelons of the social and political hierarchy: the partial “sustainability” in the power center is presented as universal “sustainability” for the rest of the nation. The rural, the marginalized, and those who cannot afford to live in cities and pay for highly priced water do not appear in this picture. The only value is Beijing’s sustainability in its supply of water, energy, clean air, and clear skies. Source: United Nations University—International Human Dimensions Programme on Global Environmental Change 2014, Inclusive Wealth Report 2014: Measuring Progress Toward Sustainability , http://ihdp.unu.edu, 220–313. In the modernization discourse in China, “de-growth” is almost unthinkable, even as China’s vaunted “growth” under the market reforms of the last thirty-five years has undeniably fostered gross economic and social injustice, incurred environmental devastation that renders large sections of the population vulnerable, and undermined the quality of life for the majority. Human-made ecological catastrophes could in one moment wipe out the gains of these decades of so-called progress. From the subject position of the ruling elite, China is forced to modernize itself to protect its national pride and sovereignty. But China’s forced modernization is not simply a cure with calamitous side effects. It is destructive such that those made to embrace it are also made oblivious to its destructive power, deprived of any other vantage point except those permitted by the dominant forces of capitalist development. Indeed, the dangers of modernization in China today should be obvious enough for anyone willing to confront them, yet those who so identify with the criteria, norms, and values of the discourse of developmentalism still allow their capacity for experience and imagination to be held captive by notions of modernity and linear progress, the benevolent power of science and technology, and monetized notions of “wealth” and “poverty.” In China’s development paradigm, “wealth” is increasingly a monetary term, and the determining factor of poverty is the simple absence of money. Under marketization, money is the “god” that produces poverty. Markets determined by capitalist relations can only thrive on the basis of socioeconomic polarization, deprivation, and marginalization. Such polarizations and inequalities have increased in China, concurrent with “growth” and “poverty reduction.” With marketization as the driving force of the country’s modernization and development, greater growth can only bring deeper socioeconomic and ecological injustice. Rather than being relegated to the level of “superstructure” or a place of secondary or complementary importance, the cultural dimensions of Chinese society and political economy should be considered part and parcel of the development paradigm. A radical change in the perceptions, values, and preferences of the popular majority is necessary for any meaningful reversal of the current developmentalist trajectory. Most people might subscribe to the ideal of “sustainability,” because this buzzword is so much in vogue in the mass media, education, and official discourse. The questions we have to probe are: How is this term so widely accepted but so little heeded? How do we enable the majority to see how in the hegemonic interpretation of “sustainability,” the interests of an elite minority displace those of the majority, thus rendering “sustainability” void of “justice”? How can people be convinced to struggle instead for a paradigm of sustainability with justice, seeing the two as interdependent? How can the relations between humans, and relations with nature, be demonetized? ↩ . ”3.28 Million People Evicted from Beijing within Three Days,” Ming Jing News, November 26, 2017, http://newsmingjingnews.com (in Chinese). ↩ Zhao Han, “20 Years of Scavenging in Beijing: Your Capital, My Ruins,” The Initium, September 14, 2016, http://theinitium.com (in Chinese). ↩ Zhao Han, “Where Are 200,000 Scavengers Gone after the ‘Beijing Eviction’?” The Initium, January 8, 2018 (in Chinese). ↩ Data from http://sciencenet.cn, March 18, 2013 (in Chinese). ↩ Li Hualiang, “Winter in Northern China: No More Coal Burning Even If the Policy Is Relaxed,” December 12, 2017, http://mp.weixin.qq.com (in Chinese). ↩ Weiweidaguan, “Smog Is Not the Real Issue, the Real Issue Is Poverty,” November 7, 2016, http://mp.weixin.qq.com (in Chinese). ↩ “Hebei Admits ‘Excessive’ Conversion of Coal to Gas, This Winter’s Gas Demand Is 234 Percent of Last Year’s,” Caixin, December 12, 2017, http://china.caixin.com (in Chinese). ↩ An Ill-Calculated Coal-to-Gas Conversion Scheme: An Environmental Protection Battle Losing on All Fronts,” Caixin, December 9, 2017 (in Chinese). ↩ Changjiang Water Resources Commission of the Ministry of Water Resources, http://ctgpc.com.cn/sxslsn. ↩ In the immediate aftermath of the repression of the 1989 pro-democracy movement, when dissent was generally silenced, the Three Gorges Dam project was pushed through at the NPC in 1992, whereas just a few years earlier, in March–April 1989, an NPC meeting had decided to postpone consideration of the project for five years after the book Yangtze, Yangtze was published in February 1989 by prominent intellectuals and scientists to publicly lobby against the dam project. ↩ Hui Po Keung and Lau Kin Chi et al., “Three Gorges Dam: Case Study,” in Vinod Raina, Aditi Chowdhury, and Sumit Chowdhury, eds., The Dispossessed: Victims of Development in Asia (Hong Kong: Arena, 1997), 37–44. ↩ Guizhen He, Yonglong Lu, Arthur P. J. Mol, Theo Beckers, “Changes and Challenges: China’s Environmental Management in Transition,” Environmental Development 3 (2012): 26. ↩ “The South-to-North Water Diversion Project Will Bring Huge Catastrophes,” Shanshui Xiaoyaoyou , December 2014 (in Chinese). ↩ “The South-to-North Water Diversion Project: A Necessary Project of National Strategy,” December 27, 2017, http://mp.weixin.qq.com. ↩ Yan Weiqi, “Survey on the Third Anniversary of the Launch of the First Phase of the Eastern Route of the South-to-North Water Diversion Project,” Jinji Daily , November 15, 2016, (in Chinese). ↩ Li Qianli, “South-to-North Water Diversion Project Has Totally Failed,” DW News, December 31, 2014. http://culture.dwnews.com (in Chinese). ↩ “Diverting Water from the South to the North? Too Polluted by the Time It Would Arrive in Tianjin,” Global Times News . October 13, 2014, http://news.creaders.net (in Chinese). ↩ “The Authorities Respond to Each of the Four Queries on the South-to-North Water Diversion Project,” China Broadcast Network, December 24, 2014 (in Chinese). ↩ Lin Ling et al., eds., A Memorandum on the Western Route of the South-to-North Water Diversion Project (Beijing: Economic and Science Press, 2006) (in Chinese). ↩ Red Flag Water Diversion Study Task Force, “Actively Planning the ‘Red Flag River’ Project to Divert Water in the Western Region, Guaranteeing Sustainable Development,” Xinhua News, December 5, 2017, http:// xinhuanet.com (in Chinese). ↩ “Today! Tibetan Water Will Enter Xinjiang: A Super Project that Shakes the World and Radically Changes China,” February 24, 2018, http://mp.weixin.qq.com (in Chinese). ↩ “Confirmed! The Largest Project in History, Radically Changing Xinjiang, Changing China!” February 17, 2018, http://mp.weixin.qq.com (in Chinese). ↩ “Statistics of Pollution Control Investment in China (2001–2014)“, National Bureau of Statistics of China, http://stats.gov.cn (in Chinese). ↩ United Nations University—International Human Dimensions Programme on Global Environmental Change 2014, Inclusive Wealth Report 2014: Measuring Progress Toward Sustainability , http://ihdp.unu.edu. ↩ Ou Changmei, “‘Ten Formulations on the Water Question’ Has Been Adopted by the Politburo, Remedying Water Contamination Will Take Three to Four Decades,” The Paper, March 4, 2015, http://thepaper.cn. ↩ André Gorz, Ecologica (London: Seagull, 2010), 27. ↩ Before the incursion of Western imperialist powers, China accounted for one-third of global trade. The British attempted to redress this trade imbalance by substituting opium for silver. The opium trade for Britain between 1821 and 1840 was worth at least 100 million yuan, equivalent to 20 percent of China’s total currency at the time, and 10 percent of the total revenue of the Manchu Dynasty (Liu Huijun, “Opium Trade and the Outbreak of the Opium War,” Sina, November 9, 2009, http://blog.sina.com.cn). When the Manchu Dynasty was determined to eliminate opium, Britain went to war with China, which subsequently lost and ceded Hong Kong to the British in 1842. In 1901, the joint invasion of eight imperialist powers not only looted the palaces in Beijing, seizing numerous items now residing in the British Museum and elsewhere; China was also forced to pay a war indemnity to the Eight-Nation Alliance equivalent to one tael per capita of silver, totaling 450 million taels of fine silver (equivalent to $333 million today) to be paid over thirty-nine years on a rising scale at 4 percent interest. By the end of the payment period, the total amount paid was almost one billion taels, or thirty-seven thousand metric tons, of pure silver. Imposing the indemnity on a per capita basis was a deliberate insult no less damaging than the material plunder itself. ↩ “The Resolutions on a Number of Questions of the Party’s History Since the Founding of the People’s Republic of China,” adopted by the Sixth Plenary Session of the Eleventh Central Committee of the Communist Party of China, 1981, available at http://marxists.org. ↩ C. A. Bowers, Educating for Eco-Justice and Community (Athens: University of Georgia Press, 2001), x. ↩ Gregory Bateson, Steps to an Ecology of Mind (Chicago: University of Chicago Press, 2000), 274–78. ↩ Félix Guattari, The Three Ecologies (London: Athlone, 2000). ↩ Michael Hardt and Antonio Negri, Commonwealth (Cambridge, MA: Harvard University Press, 2009), 67. ↩ Hardt and Negri, Commonwealth , 92–93. ↩ For an excellent review of the eight crises in China’s economic development in the six decades since the founding of the People’s Republic, see Wen Tiejun, Eight Crises: Lessons from China 1949–2009 (Beijing: Dongfang, 2013) (in Chinese). I have been part of a team of scholars working on a comparative evaluation of China as an emerging country in relation to six other emerging countries, a project that forms the basis of a forthcoming book, to be published in both Chinese and English. For related research reports, see the website of the Global University for Sustainability, http://our-global-u.org. ↩ Erebus Wong and Sit Tsui, “Rethinking ‘Rural China,’ Unthinking Modernisation: Rural Regeneration and Post-Developmental Historical Agency,” in Rémy Herrera and Lau Kin Chi, eds., The Struggle for Food Sovereignty: Alternative Development and the Renewal of Peasant Societies Today (London: Pluto, 2015). ↩ Wen Tiejun, Lau Kinchi, Cheng Cunwang, He Huili, “Ecological Civilization, Indigenous Culture, and Rural Reconstruction in China,” Monthly Review 63, no. 9 (February 2012): 29–35. This paper reviews a movement of urban youth voluntarily going to the countryside or taking up organic farming in the last decade in China. ↩ Herrera and Lau, eds., The Struggle for Food Sovereignty .